#USACUBA “SANTA” SET THE STAGE 52 YEARS AGO; Even Dauntless Diplomat Jim Donovan Would be Speechless! Even Dauntless Diplomat Jim Donovan would be Speechless! James (Jim) Britt Donovan and his Cold War negotiation style is the subject of an upcoming Steven Spielberg film featuring Tom Hanks, dramatizing the exchange of Russian spy Rudolf Abel with American U2 pilot Francis Gary Powers in February, 1962. The film has already been named the must-see Oscar film of 2015, and is set for release next October. President Obama, his administration, and its many allies and supporters on both sides of the political aisle, Raul Castro, the Cuban regime, and Fidel himself, as well as the scores of appeals and initiatives taken by the media, people in the private and public sectors, organizations, and other constituents, extending to the Canadian Government, and even the Vatican and Pope Francis are all to be commended for a truly courageous step toward this seismic shift in history restoring relations between the United States and Cuba. Let’s recall and examine how and when this shift started with a pretty big quake on the diplomatic Richter scale: In the late fall of 1962 and into 1963, attorney and negotiator Jim Donovan began negotiations with Fidel Castro on behalf of President Kennedy and his administration, and the Cuban Families Committee, and was the ONLY direct link to the President. Obama’s communication with Castro is the first direct Presidential communication since Eisenhower. 52 years ago on December 22, Jim returned home to the U.S. on December 22, 1962, having successfully negotiated for the release of 23 prisoners. His trips to Cuba continued well into the spring of 1963, ultimately resulting in the release of 1100+ prisoners in exchange for humanitarian aid provided by the Red Cross and a major pharmaceutical company, all coordinated by Donovan: a diplomatic coup striking a balance of the private and public sectors and establishing the groundwork that continued with diplomatic discussions and plans happening. Unbeknownst to the public, this coup would have happened then, but on November 22, 1963, President Kennedy was killed and a new Administration and era ushered in, politics entered the fray, and history stood still….until today. Donovan’s son John Donovan traveled to Cuba as a teenager, accompanying his father on one of his 15+ trips there to negotiate with Castro. After the failed invasion of the Bay of Pigs, Donovan was a strategic move in the Cold War chess game. Donovan bringing his teenage son on a visit was also a strategic move toward winning that chess game, salvaging relations after the failed invasion, and moving toward restored diplomatic relations. Also on this trip, the CIA actually attempted to assassinate Castro through a gift of a wetsuit that Castro was to wear with Jim on a fishing trip. At the last minute, Jim gave him another wetsuit, preventing the attack. Jim Donovan’s dauntless diplomacy as it relates to #USACUBA, to #USARussia, and yes, even to the terrorist threat and the war on terror, offers a glimpse into the history of what happened on the world stage as it happened publicly AND behind-the-scenes a long time ago. These events have largely been eclipsed by so many years gone by and because the people who were there, are no longer here. Time and distance have a way of giving events a new perspective and the best recognition of all: success!!! Finally, success! Jim Donovan’s legacy in no way eclipses the significant accomplishments and efforts of those administrations and diplomats who have tried and contributed since that time, and most of all those on today’s world stage whose efforts directly impacted this dramatic shift. If anything, Jim Donovan’s legacy and those legacies of President Kennedy and his brother Robert Kennedy, now have the best gifts ever with today’s success and the opening of a new world for Cuba, and a new channel between Cuba and the United States. All politics aside, let’s be proud of this change in the course of history. Time has a funny way of paying off. It may take a lot more time for many to adjust to this news, particularly those in the Cuban-American community in Miami who still struggle with how they left Cuba so many years ago and what/who they left behind. Respectfully to them and to the Cuban people who have suffered unimaginable loss, their feelings and opinions are all deserving. Ultimately, time will help to heal and reveal itself with the intangible gifts of freedom, change, hope, and progress. While history will always matter and never be forgotten, this is a truly momentous shift toward abundance, and the only way to look back is to move forward. As the headline from @LakePlacidNews said in 1962: “Santa Came Home (to Lake Placid) from Cuba for Christmas”. Since Lake Placid is the town where miracles happen, because it’s Christmas. 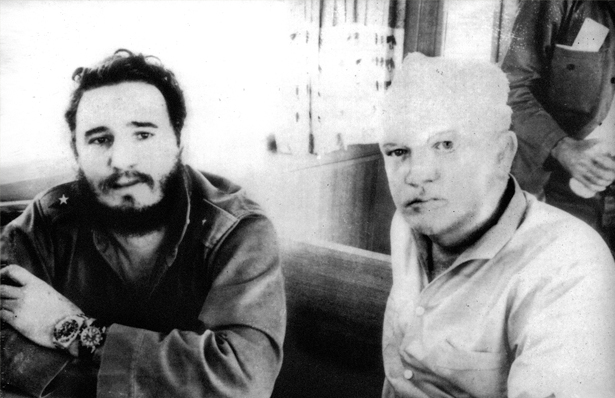 and because I believe in God, heaven, and in miracles, I will speculate on a miracle of my own: it seems that maybe Jim Donovan is still talking with Fidel Castro, having had something to do with helping to set this stage today…even from up above. Now that is truly something to consider, especially as we approach the 52nd anniversary on December 22 and of course as we approach Christmas on December 25. This year, “Santa” is not only President Obama, but also Pope Francis? Wow! There are just no words that give enough deference to how this was done to bring these prisoners home for the holidays beginning on Hannukah. As a Catholic, Jim Donovan and I am sure – President Kennedy and his brother Bobby – would not only approve, but very happily step aside in history for a Pope who is not only changing the Catholic Church, but changing the world. Given Jim’s wife and my grandmother’s personality, her influence with my grandfather, and her staunch Catholicism, this is something that seems to have her written all over it. Only at Christmas is it possible to speculate on such thoughts, but boy do I wish she and Jim were here to enjoy all of these wonderful pieces of news this year with us. Until we meet again, this event is the best Christmas/holiday gift ever for the released prisoners and their families, for Cuba and the United States, and for diplomacy. The events/news of 2014 is most certainly the best Christmas gift ever for the legacy of Jim Donovan, for my grandparents, for me, for my family, and for the next generation who hopefully looks to this day and this history to inspire their future ambitions. The legacy of Jim Donovan is dedicated to a commitment to education, the law and the defense of the unpopular cause, diplomacy and the art of negotiation, the preservation of history, public service, the arts and the humanities, and to empowering and inspiring others to commitment to a life enriched by any/all of the above. His legacy serves as a role model for those of all ages, and especially to those parts of society and the world with limited opportunity and to the next generation. For additional information and continued updates on news in 2015, please visit http://www.jamesbrittdonovan.com/.org or http://www.jamesbdonovan.com/.org and/or contact info@www.jamesbrittdonovan.com/.org.